In an underwater cavern off the coast west of Marseille are the first human engravings known to man. Among them is a crude drawing of a three-fingered hand, which has long puzzled archaeologists. Is it a hunting signal? A mystic sign invoking the spirits? Or is it, as many believe, evidence of ritual mutilation in a Shamanistic world? "The Hunter" evidently believes the latter. Driven by inhuman voices to maim and kill, he severs the body parts of his victims - and signs his savagery with a print of a three-fingered hand. Commandant Michel de Palma, of the Marseille murder squad, heads to the university in Aix-en-Provence to investigate further, but the clique of pre-history professors he encounters are as hard to unravel as the meaning of the cave-drawing itself. As he gets closer to the truth, the group of academics close ranks. Slowly and alone, de Palma begins pursuing a mystery that dates back to the Ice Age. 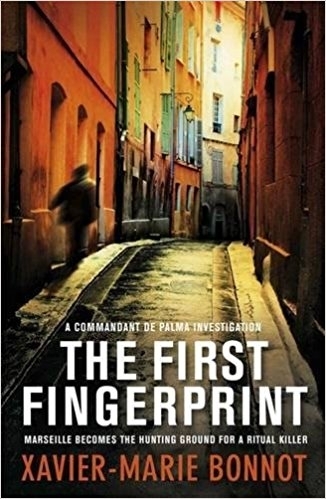 The First Fingerprint introduces a policeman as polished as he is brutal, as charming as he is deceptive. Michel de Palma, called "the Baron" by his colleagues, knows the dark underside of the city of Marseille as do none of his rivals. But his enemies are everywhere: in the crime-infested sinks of the suburbs; in the sleek and squalid bars of the old quarter; even in the police ranks themselves.